Many demographic analysts classify the growth and dispersal of Hispanics and immigrants into the three-way split of traditional receiving states, new destination states, and other states (e.g., Suro and Tafoya, 2004; Fix and Passel, 2003; and Bump, Lowell and Pettersen, 2005). This paper’s typology is based on the level and growth of Hispanic public school enrollment, rather than the entire Hispanic population. 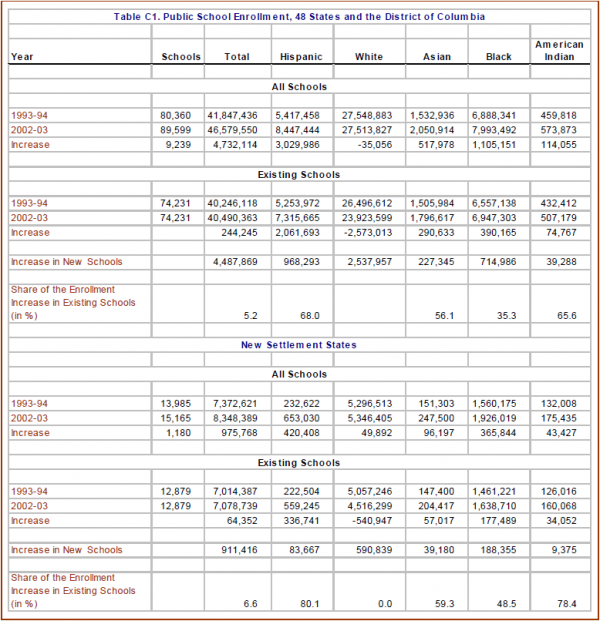 Appendix Table B1 reports the 1993-94 level of Hispanic school enrollment and the absolute and percentage increase in enrollment for 48 states and the District of Columbia. The bulk of the increase in Hispanic enrollments (69%) occurred in the six traditional Hispanic states: California, Texas, Florida, Arizona, Illinois and New York. Hispanic enrollment increased by more than 100,000 students over the period in these states, and each educated more than 300,000 Latinos in the 2002-03 school year. Not surprisingly, many states experienced triple-digit growth in their Hispanic school enrollment. However, some of the states with very large percentage increases in Hispanic enrollment (such as Alabama and Kentucky) had few Hispanic students in absolute number in either 1993-94 or 2002-03. The criterion to be a “new settlement state” is based on both percentage growth as well as absolute increase in Hispanic enrollment. The 10 new settlement states at least doubled their enrollment of Hispanic students. In absolute terms, half of the 48 states and the District of Columbia enrolled an additional 22,000 Latino students from 1993-94 to 2002-03 (or the median state increase is 22,000 students). New settlement states doubled their Hispanic enrollment and had an enrollment increase in excess of the median enrollment increase. 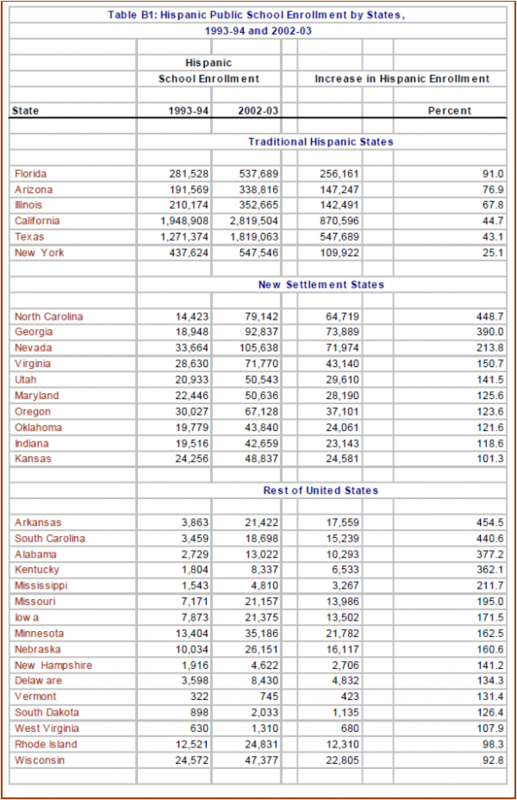 The 10 new settlement states are not strictly confined to the Southeast and include fast-growing states in the west (Oregon, Nevada and Utah) and in the heartland (Oklahoma, Indiana and Kansas). 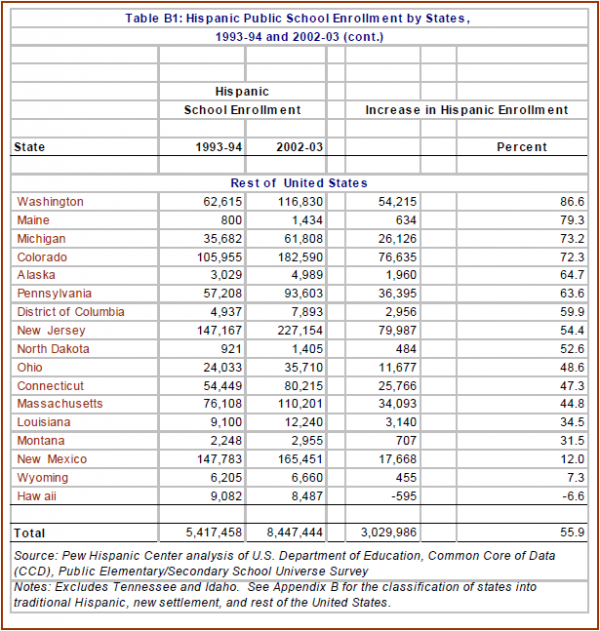 By construction, public schools in the “new settlement states” need to educate significantly greater numbers of Latino students and prior to the 1990s they had little experience educating Latinos.